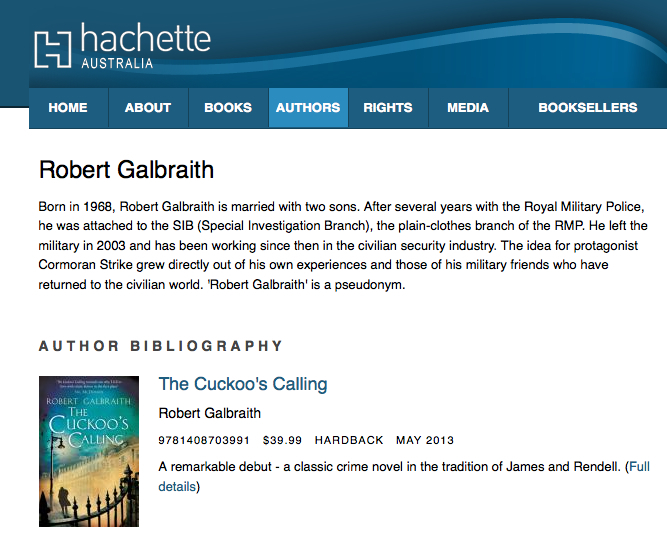 When it broke that JK Rowling was the writer behind The Cuckoo’s Calling using the pseudonym of Robert Galbraith, the internet exploded with the news. A previous blog post addressed how it might challenge what it means for an author to be discovered. But there’s also a question of a writer’s identity when using a pseudonym. Using a pen name is not that uncommon. There’s a long list of famous authors and their pseudonyms from classic authors like George Eliot (actually Mary Ann Evans) to more modern uses like the author of the Jason Bourne series Robert Ludlum who also wrote under the names Jonathan Ryder and Michael Shepherd. A few people have claimed the choice was a gender issue, but in this day and age it is less likely that Rowling put that at the top of her list. Unlike Eliot’s time, there is less of a stigma against female writers in genre fiction. But using a different gendered pen name isn’t a crime, and sometimes based on the genre it needs to be done. My question is not whether or not a pen name should never be used. I have no problems with using one, and have actually considered creating one myself if I produce works in completely different genres. In the erotica genre, many of the writers use pen names for obvious reasons. But what grabbed my attention was that Rowling’s Galbraith actually had a fabricated bio, and one that is quickly disappearing online. One of the reasons Rowling’s jig may have been up is because in this digital age, what author doesn’t have an online footprint? Although I can’t attest to what was there before the leak, it appears that not many sites have the fake bio without admitting it’s a pseudonym. My biggest question is whether or not if a writer uses a pen name, is it okay to create a false biography to go with it? Galbraith had military service as part of “his” bio. Not only did Galbraith state his military background, but the bio says how the protagonist of the book, an Afghanistan veteran, was based off his own experience as well as those of his friends. In the United States, falsifying military service is an actionable offense, not to mention that it is offensive to those who do serve since Galbraith’s service is meant to give his book authenticity. If Rowling hadn’t made up such a specific bio that served a purpose to the book’s content, perhaps it would have been a more acceptable use of a pseudonym. One of the reasons I discarded the idea of creating a pen name was because it’s just too easy to search online. If I did create one, I would probably still attach it to my main author website and use it as a genre identity. There’s no reason for pen names to disappear all together, and it’s not going to happen. In fact, it’s technically her second since “JK” Rowling is actually Joanne. But I question how much they’re needed in today’s digital world. I also am not as enthusiastic with creating a false bio, but what are the alternatives? In any case, Rowling as Galbraith joins a long list of honored authors who pen a different name for their writing identities. And I’m not revealing my potential pseudonym as “she” might still publish some day. I had no idea before reading your blog that she had created a false biography to go along with it especially in this case. I’m cool with the idea of having a pen name, but this seems to be taking it a little too far all things considered. If Robert Galbraith had to be more believable, there are probably other things she could have done instead. I was talking with somene about how the secret was discovered in the first place, and said that it didn’t help her that she hadn’t created a false presence online like a webpage or Facebook page. But even in that scenario had she done so, I wouldn’t have liked it if she tried passing Galbraith off as real. I like Lemony Snicket who uses his “representative” Daniel Handler as an example of how to do it well. Handler lets everyone in on the secret, but we still say those books are written by Lemony Snicket. Brilliant! I think it’s her use of specific military background that bothers me, and not just because I’m a military spouse. To me, it seems disrespectful to those who really have served in order to market the book. Plus, I think it takes away from anyone who really has served and wants to use their real service to market their own book. I didn’t know about the fake bio until I started searching for other articles about her pseudonym. The picture I included was from one of the only sites to still have the fabricated bio info, but even at the end it says it’s a pseudonym. Remember that ‘JK’ was advised because Bloomsbury (allegedly) implied that a female writer would not be well received, so Joanne or Jo became JK, a gender-less author. The usual reason for a pseudonym is privacy. Who would want legions of fans (we should all be so lucky!) tracking down our house and camping outside, clamouring for an autograph? Who would be happy about the writer’s mother, sibling or even the children being stalked? With a pseudonym, privacy is assured from all but the most determined hacker. The false bio? Yes, it’s morally (even legally as you point out) questionable – but would you read a military exploits book that had been written by a children’s author? No, the bio lends credibility to the writer – right up to the point that it is exposed as a sham. It’s definitely a questionable situation. You’re right – I’m not sure I would read a military exploits book from Rowling. And writers have the right to have things in their works that they didn’t live directly. I guess I’m discovering that if she had picked something other than military, I might have been less critical. That just seems like a dicey profession to use as her cover. And I don’t say this because I’m a military spouse. Also, she took it a step further to say that Galbraith had special forces experience, which is really disrespectful in the long run in my opinion. As far as the problem with privacy, may all of us writers have to deal with that issue once we’re a huge success! Not so much from just random stalkers. I was okay with Rowling using the name Robert Galbraith until I found the fake biography. Then it didn’t sit as well with me because it felt like it was duping the potential reader because of the false military background. Would I care as much if she had picked a different profession? I don’t know. Like you said – food for thought! Okay-that was what I didn’t pick up on at first. Our military should not be used in that way. Thanks for bringing it up. Happy to. The more I’ve commented back, the more it’s made me think about it. She didn’t just have Galbraith as a British military member. She made him part of their special ops. To me, that’s really going to far. But then again, another person commented that if Rowling had used her name to publish in the first place, the general population would have judged her for writing a military character. It’s definitely a different situation. it doesn’t sit well, at least the military aspect. If you’re going to create a false bio for a pseudonym, use elements of your own life that people might not be familiar with? That’s a hard question to answer. I think that when the pseudonym’s bio is being used as a marketing tool to authenticate the book’s content, then yes, maybe the author should use his or her own life to pull from. What if the book were about being a teacher? Would be feel the same way if Galbraith’s bio (falsely) claimed years of experience teaching? Probably not. And that’s where it gets tricky. It also gets tricky if we try and limit what subjects a writer can write about based on life experience, even under a pen name. I still like the idea of a writer having a known pseudonym that’s a genre identification. So if I wanted to write mysteries and paranormal romance, people would know both names were me, but could choose to read or not read one of the genres. Actually, a good example of this for me is Seanan McGuire. I love her October Daye series, but I also love her Zombie series she writes as Mira Grant. And I know anything she writes under Grant’s name is for horror. Mira Grant’s website (http://miragrant.com/) talks about Grant as a real person, but the picture is McGuire’s. On the FAQ page at the bottom, she tells her real name and points you to her main webpage (http://www.seananmcguire.com/). So there’s an acknowledgment but at the same time a clear identity that I’m okay with.